Once ugly, Boston's waterfront is now among the city's most appealing places to visit. The New England Aquarium and Boston Harbor cruises are highlights. East of Faneuil Hall Marketplace and south of the North End is Boston's Waterfront, another area in which restoration has brought new life and vitality. The solid old brick and granite buildings which once served as warehouses for India and China traders have been modernized and converted to offices, shops, restaurants and apartments. You can easily walk to the Waterfront from the Financial District, Faneuil Hall Marketplace, Haymarket or the North End, or take an MBTA subway Blue Line train to the Aquarium station. 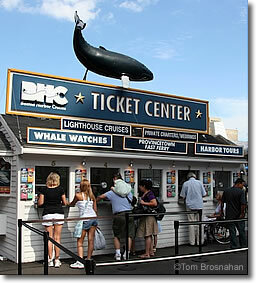 Buying tickets for a whale watching cruise.